This article is going to talk about the methods to redistribute disk space when Windows 2008 Server says low disk space. Windows 2008 Redistribute Disk Space? Do you know that you can redistribute disk space on Windows Server 2008 so as to allocate disk space more reasonably? 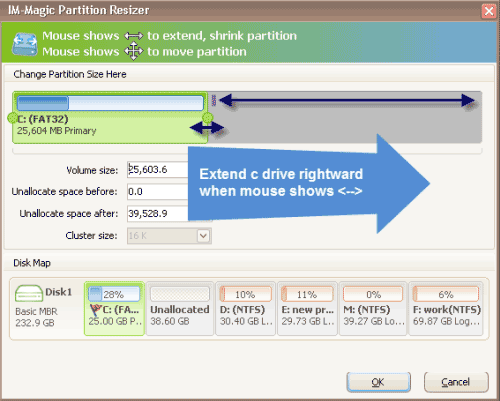 You just need a third-party partition tool IM-Magic Partition Resizer Server. This partition software enables you to shrink partition to create unallocated space and then move the unallocated space to the partition that is lacking of free space to get it extended. This partition software provides easy and safe way to help resize hard disk on all Windows Servers including Windows Server 2008. Download, install and run IM-Magic Partition Resizer Server. Right click partition that has enough free space and choose "Resize/Move" option. Move the arrows to shrink the selected partition so as to produce some unallocated space. "The 50GB C drive (system partition) is nearly full on my Windows Server 2008 PC. I have not saved any data to this partition except installing the operating system and some programs. I tried to perform disk cleanup to free up some space, but it only help free up about 200MB space. 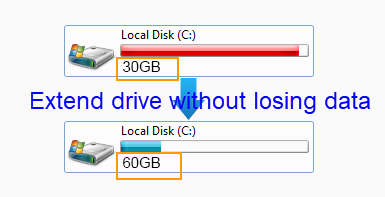 Is there any way to redistribute more disk space for C drive on Windows Server 2008?" "My friend told me that I need reparation the hard disk and reinstall operating system if I want to resolve the problem about low disk space on C drive on Windows Server 2008, but I don't know how to repartition hard disk or reinstall system. So I want to look for a way to resize C drive without reinstall system or repartition hard disk. Can anybody recommend any easy and useful solution?" How to Redistribute Disk Space for Windows 2008? When referring to redistributing disk space, probably, you may think of backup important data and then repartitioning the hard disk. It is a way to reallocate disk space, but it is often difficult to handle and time-consuming. Now, with the professional partition software IM-Magic Partition Resizer Server, you can easily perform hard disk resizing and reallocate disk space without repartitioning hard disk. You do not even need to backup any data, because the partition software provides a secure way to redistribute disk space without touching any original data stored on the disk. This partition software allows you to move unallocated space from another partition to the partition that is running on low disk space. Unallocated space is always needed in order to increase the size of a partition that is lacking of free space. Then, how to produce unallocated space? Usually, you need to shrink the partition that still has much free space and squeeze some unallocated space from this partition. Such kind of task can be accomplished by using the third-party partition software, which enables you to shrink any partition on the same hard disk to create unallocated space. In addition to relying on the partition software, you can also shrink a partition under Disk Management in Windows Server 2008. You just need to open Disk Management and right click the partition that has much free space and select "Shrink Volume" option. After shrinking partition, you need to move the unallocated space close to the partition you want to extend. Windows Server 2008 has no built-in tool that can move a partition, so you can only rely on the partition software to move the unallocated space. When the unallocated space is right adjacent to the partition you want to extend, you can add the unallocated space to it by using partition software. And you can also right click the partition you want to extend and choose "Extend Volume" option under Disk Management to get the partition extended.